Since today is Earth Day, I felt it an apt time to share a few things I’ve learned over my years working for a company that began life as a commercial printer and continues to produce a great deal of print. Before coming to Los Angeles and The Pace Group, I worked for a company that sends billions of commercial emails. As such, I’d taken as gospel that electronic communication became ubiquitous in part because it is efficient and effective, but also because our society was becoming more conscious of the impact print and, by extension, the production of paper was having on the planet. One look at the image of a clearcut forest was enough to swear this man off from ink on paper for years. Once I became employed by Pace, however, while my job didn’t entirely change – digital marketing is still my primary expertise and responsibility – my perspective on how a printer sources paper certainly did. I was introduced to the Forest Stewardship Council’s (FSC) standards and certification for printers who, like Pace, support responsible management of the world’s forests. I became familiar with how soy based inks and aqueous (AQ) coating can preserve the recyclability of the paper. I also became enamoured of the tactile qualities of different paper stocks and how well-designed and engineered print pieces can elicit an emotional response from its audience. In short, I rediscovered the unique medium that is print while realizing that the environmental concerns associated with it were myths that should not deter a marketer from keeping print in their marketing mix. So while we are now a company that can engage people in a variety of ways, print remains a large part of who we are and what we do and singing the praises of ink on paper is as natural for us as the forests that surround us. 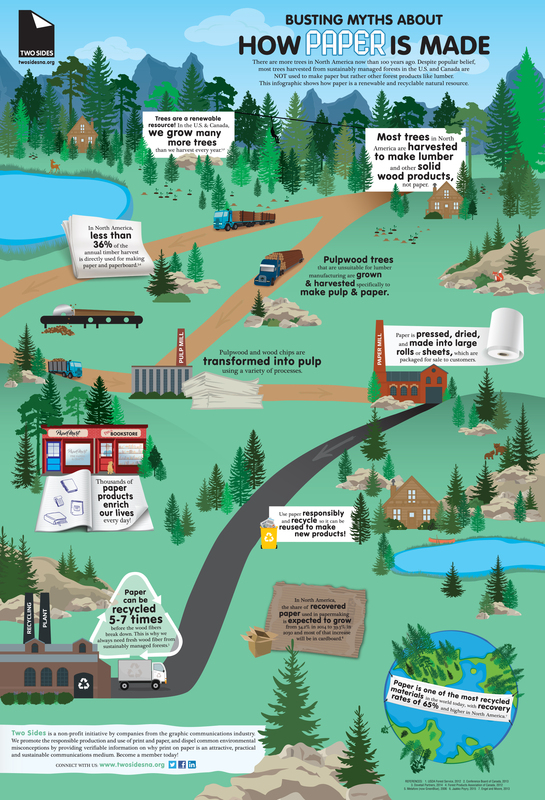 I hope you enjoy the below infographic on how paper is made and if you have any questions about our print capabilities or our commitment to sustainability, please do not hesitate to contact us.